Saraca Indica commonly known as Ashoka tree or Sorrowless Tree is one of the most exotic flowering trees of the Indian subcontinent. It grows natively in warm humid climates of Pakistan, India, Myanmar and Malaysia and belongs to the Fabaceae family. Ashoka is ever-green, slender but slow-growing flowering tree. It is easy-to-grow, easy-to-prune tree that flowers abundantly and produces a compact shaped canopy – an ideal candidate as a houseplant or a lawn tree. Ashoka tree produces large bunch of sweet smelling flowers throughout the year; profuse flowering occurs from February to May. The flowers look like the flowers of Ixora. Each bunch consists of a lot of small flowers that are shaped like long-tubes which open out into four oval lobes. The flowers display a lot of different colors. Young flowers are yellow that later acquire hues of orange and then ultimately become crimson with the passage of time. The colorful stamens of Ashoka flowers form a ring of white and crimson shades and give a hairy appearance to the flowers. 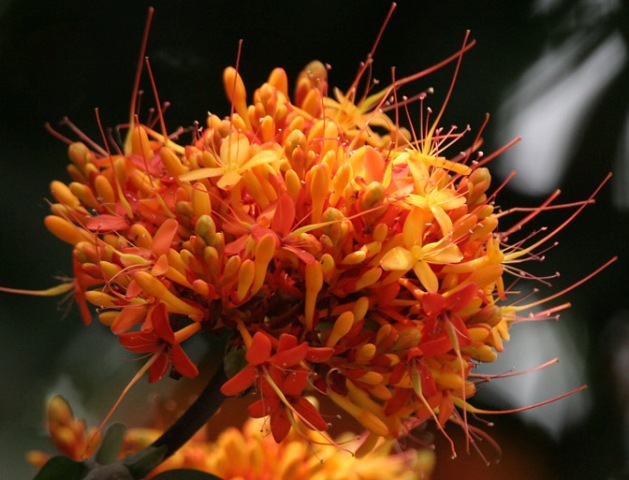 The colorful flowers of Ashoka are accompanied by soft, deep-green, and shiny leaves. The young wavy leaves are softer and red in color and closely resemble the leaves of Polyalthia Longifolia or The Mast Tree. The Ashoka tree has many folklores associated with it and is considered sacred throughout the Indian subcontinent, especially in India and Sri Lanka. It is believed that Queen Maya gave birth to Siddhartha Gautama, the founder of the Buddhist religion and doctrine of Nirvana, under an Ashoka tree. Buddhists hold this tree in high esteem. Hindus also revere Ashoka tree and dedicate it to Kama Deva, the god of love. Ashoka tree has many medicinal uses. The bark is used in traditional medicines to cure a number of gynecological problems. The pulp of flowers is used as a remedy for dysentery. Ashoka tree can be grown easily in warm and humid climates. It prefers a well-drained and organic soil.